Get involved at Union Street Gallery. Business matters are handled at our board meetings. Artist Community is built at our Make & Share, Critique, Receptions, and other events. The tentative 2019 calendar has those dates, which are also posted on our Facebook (Union Street Gallery). This is a relaxed artist community setting where artists can come to share information, successes, and struggles or ask questions or for casual feedback. This will be a self-run gathering based on attendance. Lower attendance may mean a larger group for talking, and higher attendance may support smaller groups for conversation. There will be a sign in sheet that services as proof of attendance/involvement for studio and guild artists, but also as a way to organize the order for speaking. Feel free to bring snacks, etc. These will usually happen the second to last Saturday of every exhibit. Gallery Coordinator and local professor, John Gutierrez, will facilitate these critiques. Expect to be able to dialogue within the interpretive, formal, and philosophical aspects of work. Each critique will be 10-15 minutes, which includes a brief introduction to the piece from the artist. There will be a sign-up sheet to determine order. You are encouraged to attend if you have not participated in a formal critique before or recently to get a sense of the event. The will usually happen the last Saturday of every exhibit. We offer free admission during all gallery hours to encourage art appreciation and education for all. We greatly appreciate a suggested $5 donation per person. Tours and classes are just a few of our educational offerings. We are happy to help plan a tour and/or activity for your group, depending on the availability of our volunteers. We can typically accommodate up to 20 participants for tours, and 8-12 participants for activities. Field Trips are only scheduled during exhibits; please check our exhibition calendar prior to contacting us. We are happy to work with you to schedule a time for the Field Trip. We request that you contact us at least two weeks prior to your desired field trip date. Complete the field trip form and submit it to info@unionstreetgallery.org. Groups of up to 40 participants can usually tour the gallery at once. If your group is planning to visit and would like a guided tour, please contact the gallery to make sure we can accommodate your group and schedule a volunteer docent. We ask that you schedule this at least two weeks in advance and appreciate a donation of $20. Smaller groups can stop in during any open hours without notifying us, as long as they are not expecting a tour. 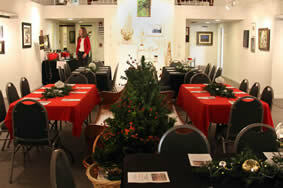 Union Street Gallery is happy to host classes and workshops. Most of our offerings are handled with the artist or teacher of the class. Please pay careful attention to whether you should be contacting the artist or gallery in order to register. Below are class offerings from the gallery or studio artists. Host your event in our gallery – contemporary art and a historic building will be your backdrop. It’s the perfect backdrop for art lovers. Rentals can only happen outside of regular gallery hours, and must be during an exhibition. Please keep in mind that the art always comes first. We do not know what show will be installed during your event, or how that show will impact the gallery space. Event rentals must work around exhibits.